If you are an Arduino programmer, the link above will take you where you want to go. But suppose you wanted to try programming and using the bluepill a different way? Well that is what this blog entry is about. An Ada port was done via AdaCores Ada_Drivers_Library and the Libre GNAT toolchain to the bluepill. This is preliminary work but it is able to generate working code that the author already is using as of yesterday (a garage parking measurement sensor). The port of the library is derivative, starting from the STM32F4 series, the STM32F1 is a 10yr old design and as such, the F4 is an extension of the the F1. The F1 has some idiosyncrasies that seem to have been addressed in the F4 (eg: GPIO setup). The port fixes the SoC freq at 72Mhz. No low power work has been done yet but I assume in a WFI setting with peripherals not enabled, it should draw not too much current even with a 72Mhz functional speed. The embedded runtimes library has 2 flavours of runtime, a full and a small footprint (sfp). With only 20k of ram, even sfp is too dear for a bluepill so a new runtime that is very close to sfp was created, called ssfp (super small footprint). This runtime strips down the stack sizes to minimums, hopefully this won't bother users too much. Each family is a subfolder. lsm9ds1_f103 my preliminary 9dof sensor start. I don't plan on using it with a bluepill. spi_f103 Interfacing SPI to an Atmel 25640 (a 64k byte EEprom). vl53l0x_f103 My garage distance project. For debug I use openocd-0.10 and a donor Stlink v2-1 from any discovery or nucleo board. Bluepill running the try_f103 program connected to the STlinkv2. 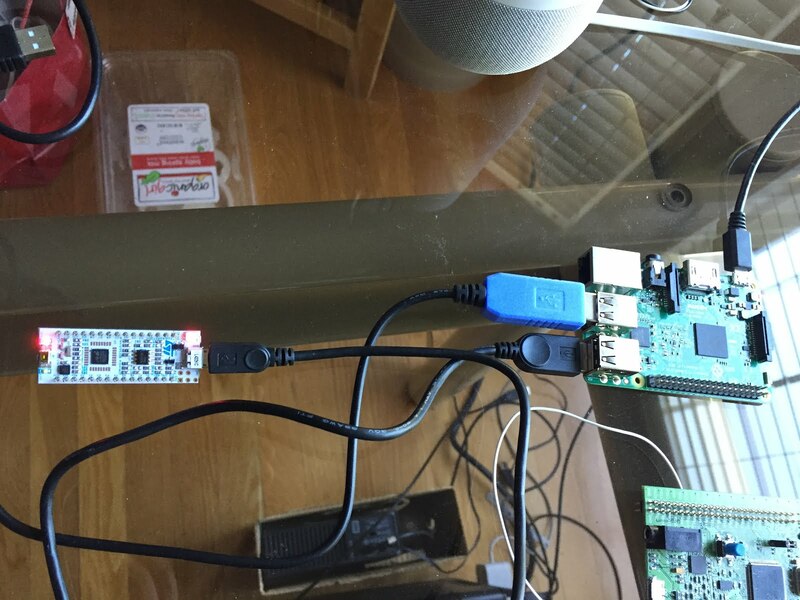 This is using the Raspberry Pi3 as a Wifi openocd server as is documented on this blog. Integrated Information Technology or as that mouthful was abbreviated to: IIT (now 8x8) was founded by Chi-Shin Wang and Y.W. Sing two Weitek veterans. Its original product line was floating point coprocessors and lived in a niche before the giant sucking sound was heard of Intel vacuuming up peripherals such as floating point. At that point, a new product was needed. From 1989 a small group was working on a Vision Processor (VP). This SIMD(4) engine took a year or so to build. Its first customer was Compression Labs (CLI). The VP had a large reg file 64 16bit regs times 4 SIMD instances. This was so CLI could execute the 16x16 DCT. An 8x8 DCT is far more modest in reg consumption. Another customer for the part was AT&T with the videophone 2500 in 1992. So at this point, IIT had a reasonable video business with customers that had application processors that would use the VP as a video engine. About this time a search was underway for IIT's very own controller. Chi-Shin found a 'bargain' from Stanford, Mips-X for $15K! What do you get for $15K? You get a tape from Stanford's tech licensing group. Paul Chow (now EECS prof at Toronto) sat with us for a week to go over the tape. I worked with him to understand the SW tools offering. For one item, there was no C compiler for it, there was however an assembler written in Modula-2. Over the years I wrote and maintained our port of GCC to Mips-X. Having 2 delay slots broke the reorg pass of GCC on numerous occasions with the usual email chain from me to Richard Kenner and workarounds to deal with reorg issues. Finally I wrote our own 8x8 pass in GCC that fixed up cases where a hazard was in slot1 and slot2 used it. Rather than use the Modula-2 assembler, I wrote one in C. The linker, nld, in C++ (props to Jeff Loomans at a poker game who told me to learn C++, the linker was my first C++ program). From a HW standpoint, there was no schematic(!). There was a layout, not sent out(!). So, IIT sent the layout to the fab. It came back and had severe voltage range issues. Also, it was a black box, i.e. provide a clock, take it out of reset, and it fetched a few instructions and was dead, lifeless. Observing the code, it was clear that it was a cache issue, since the first few fetches worked until a loop branched back. Luckily for us, there was a pin to disable the cache, then, it worked. the new interrupt interferes with the pipleline restart and you are back in the handler with a half baked restart of the prior interrupt return. In the PSW is an e bit. The bug we found was that the exception began chain shifting again making the e bit and recovery using the chain regs impossible. How to then return from interrupts? Lets look at that reg closely, observe the inversion of S3..S0, writing 0 gets the maximum suppression. How is that useful? Lets look at this tail end of an interrupt handler. Observe R0 being assigned to the reg. Without this we cannot get back cleanly from an interrupt. Since the reg's original purpose was unknown as the problem had not manifested itself yet it really was pure serendipity that it exists at all. Also, the inversion... Had it been not inverted and a linear map of write N get N suppress, then that too would have failed. You see at the end of the interrupt handler, the regs have to go back to the values they had at the time of the interrupt, only R0 on the Mips-X, which is hardwired to 0, can be dependably used. Amazing. Now you have a connection to your board. See your support agreement for details of warranty and support. no warranty for this version of GDB. Type "show copying"
This GDB was configured as "--host=i686-pc-linux-gnu --target=arm-eabi". Type "show configuration" for configuration details.For help, type "help". Transfer rate: 22 KB/sec, 7851 bytes/write. Breakpoint 1 at 0x80007b6: file b__dac_sw.adb, line 176. The real win is you have 4 USB ports for connections to targets. Also the Adafruit SiLabs USB<->RS232 dongle works well so you can get UART data from an embedded target. With a Pi2 you lose one USB port for the WLAN dongle. Here seen connected to the STM32L432 nucleo and is the target from the session show above. Also in the light blue housing we see the Adafruit usb to ttl serial cable. A Raspberry Pi and a pinoir camera make for a good motion capture camera. There is always an impetus to hack, the impetus in this case came from theft at my company. At night, someone had been walking off with hardware from cubicles. One was just down my aisle and was perhaps too close to home. Not wanting any of my stuff wandering off, I wanted a camera that would record motion and save video only around the event. I did not want to process 8 hours of raw, mainly motionless video each day when I came in. Currently as it works, each file per night is about 80MB. These files are saved over the LAN on a file server, in this way not polluting the SD card on the Pi. The files can be viewed by VLC and are H.264. This sensor needs some connectors added, a small crimp connector is added to the bare wires and hot air used to shrink a sleeve around the bare connector. For quick and dirty hacking, my goto language these days is Ruby, this project was no exception. A gem called PiPiper (Silicon Valley fans?) is used to convert GPIO levels to events that Ruby can act on. 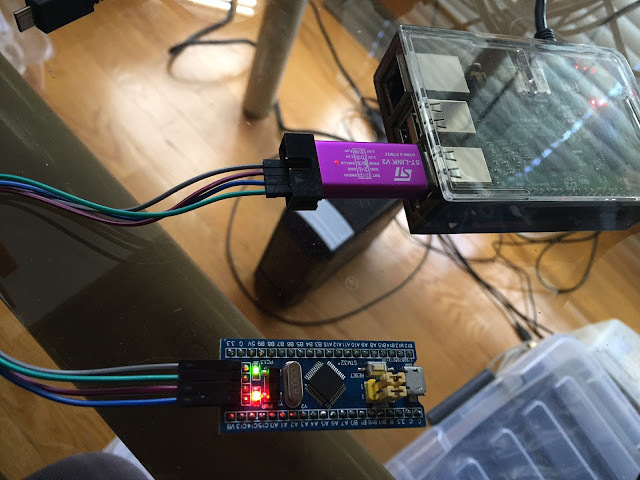 An event called out by the GPIO going high is generated by the sensor when there is motion, this in turn unblocks a forked raspivid process (raspivid being the canned camera app the RaspberryPi foundation ships). So, via 2 signals SIGSTOP and SIGCONT we can command raspivid to stop and go. raspivid has some buffering already in place so when you say SIGCONT it has the last N seconds of vid ready to go, then the camera is allowed to proceed for some grace period after the event. Finally, via a timer, the SIGSTOP is sent. In this way, smaller video files are generated. I am using GPIO 18 for the event pin. The setup looks as above, a PiR connected to a Pi3. On the wall is a 12v IR ring for night illumination, it glows a dull crimson as its photodetector senses darkening ambient conditions. 1) No RTC on the Pi. I have a cheap $8 Banggood kit clock thats in the field of view. That is my source of time. The console output on the Pi helps also, as long as you have the correct time set on the Pi. 2) I recommend a Pi3 as it can do more than just this and is useful to have around. I am cabled up as I found that every 30secs or so the WLAN emits a wpa supplicant pkt that couples with the sensor and generates false events. 3) Audio would be a plus. The name comes from the half-word instructions on the 36bit KL-10 processor. So for this blog the hrrzi instruction means halfword from the right to the right, zeroes on the left hand size, and an 18bit immediate in the right half.